Oman will be holding elections to select members of the seventh Consultative Council, the Majlis al-Shura, which has been promised greater powers since the outbreak of unrest inspired by the Arab Spring. The polls, to be held on 15 October, have prompted considerable interest among voters, and with more female candidates in these elections, Omani women are hoping to secure greater representation after a poor showing in the last polls. What is the Majlis al-Shura? The country's ruler, Sultan Qaboos Bin Said al-Said, established the Consultative Council in 1991 in a drive to modernize Oman's government structure. Until recently, the body's purpose was only to advise the government on socio-economic issues, with no real power. Following the mass protests in February and March, Sultan Qaboos promised the council would get some legislative and regulatory powers. The extent of these is not yet clear. Deputy Interior Minister Mohammed al-Bousaidi said last month that the sultan had ordered a "study to expand the council's powers". However, all important decisions are likely to continue being made by Sultan Qaboos. The Majlis al-Shura is a part of the Oman Council, along with the Council of State, whose members are appointed. How is the council elected? Consultative Council members are elected directly from all provinces of the sultanate. Each district with a population of 30,000 elects two members, smaller districts choose one. Candidates with the greatest number of votes are elected for a period of four years, after which they can run for a re-election. Omani voters living in other Gulf countries cast their votes on 8 October. No observers from outside the sultanate have been invited to monitor the polls. In total 1,133 candidates are competing for 84 seats in the Consultative Council this year. Any Omani citizen of at least 30 years of age can stand for election. Oman's ministry of information website states that candidates also need to have "good social standing and reputation" in their districts, must not have a criminal record and must have "a reasonable standard of education and appropriate practical experience". Are Omanis keen to vote? New legislative and regulatory powers granted to the Majlis al-Shura have generated strong public interest. More than 500,000 people out of a native population of 1.9 million have registered to vote, up by one third from over 380,000 in 2007. About 40% of the people in the sultanate are under the voting age of 21, according to official figures. The Omanis gained universal suffrage in 2003. Voters were previously chosen from among tribal leaders, intellectuals and businessmen. 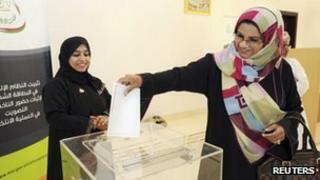 Oman is one of the few Gulf states which encourage women to participate in politics. In 1994 it became the first Gulf state to grant women the right to vote and stand for public office. Ten years later, the sultan appointed Oman's first female minister. She was responsible for higher education. However, the number of female candidates in the Consultative Council elections slid over the years from 27 in 1997 to 15 in 2004. Only two women were elected in 2004 and both represented constituencies in Muscat, the capital. None of the 21 female candidates succeeded in the 2007 elections. Many women accused voters of not taking them seriously. They even hit out at their husbands for stopping them from registering for the election, according the Times of Oman newspaper. This year, women appear to be in a better position to gain seats, because as many as 77 female candidates are competing. Also, there is a 3% increase in registered female voters. However, some observers say women need to make more effort if they want to succeed at the polls. "Unless they start campaigning aggressively by using all the tools available to them, the male prejudice will continue," Huda al-Siyabi, a former director of the Women and Children section at the Ministry of Social Affairs was quoted as saying by Times of Oman. Are Omanis happy with the level of democracy they have? Sultan Qaboos has ruled as an absolute monarch for the past 40 years. However, his policies have proved popular in spite of the lack of a democratic government. Following a wave of pro-democracy protests across the Arab world, Oman's main industrial centre, Sohar, saw a rare outbreak of discontent in February. However, rather than calling for serious regime change, Omanis have demanded changes to things that directly affect them: job creation, greater state control over spiralling food prices, more power for the Consultative Council and an end to the perceived corruption of some government members. The sultan responded quickly by promising more jobs and benefits as well as greater powers for Majlis al-Shura, in addition to sacking 12 of his ministers. What about democracy in other Gulf countries? Elections are becoming more frequent in the Gulf, as Arab monarchies take tentative steps towards meeting demands for reform. But only Kuwait and Bahrain have elected parliaments and in the latter the elected chamber shares legislative power with an appointed upper house. When and where can votes be cast? There will be 105 polling stations across the Sultanate. Voting will be held from 7am to 7pm and the results will be announced the same day.